Staying competitive in today’s building materials industry is a never-ending challenge. Meeting customer expectations, controlling costs and managing inventory during fickle construction market cycles are key to staying ahead of one’s competition. These are perennial challenges, as vital to the operation of lumber yards of old as they are to suppliers today. As companies continue the struggle to maintain a dominant place in the building materials industry, successful ones are investing in technology that gives them the ability to run their operations more efficiently. For companies struggling to stay competitive or to stay ahead, understanding available tools and which tools best address their needs are the first steps to improving or maintaining that competitive edge. In looking forward to where one can go, it’s good to know from where one came. First, let’s take a brief look at what tools and methods companies of the past had at their disposal. We’ll then identify the two areas of innovation that have most affected businesses operations and the positive impact of these technological advances. Finally, we will discuss current state-of-the-art technology helping companies reach even greater levels of efficiency. Companies in the early 19th Century were limited in the ways in which they conducted business. 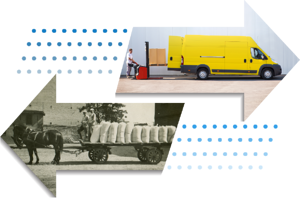 From the 1850’s to the 1950’s, considerable advances in technology and innovation resulted in new ways for companies to run their operations and to gain a competitive edge. Businesses that were slow to adapt to these new innovations were often left behind. We are now in The Computer Age, where cutting-edge technology in communication and information-gathering has increased the number of tools available to help companies minimize cost while increasing customer satisfaction. While the basic challenges facing the industry continue to evolve, advances in two major areas – transportation and communication – have transformed the way in which companies respond to those challenges. Movement of product, for example, was once performed by wagons, traveling on dirt or macadamized roads. The advent of the canal system, followed by the invention of the steam engine, made the movement of large amounts of goods faster, more reliable, and less expensive. The development of the internal combustion engine led to the creation of vehicles that changed the face of both local and long-distance delivery. Communication, which has also had a radical shift, in the first half of the 19th Century was primarily handled by personal couriers or by mail. The invention of the telegraph was a major technological advance, making rapid communication between long distances possible. The radio and the telephone made such communication virtually instantaneous. Today, computers and wireless technology allow for the sharing immense volumes of information between companies anywhere in the world. Innovation continues to expand exponentially into the 21st Century, as business operations tools provide visibility to unprecedented amounts of information, offer ways to store, compare and rate performance and allow up-to-the-minute visibility to inventory and fleet operations. With all of the technology available today, many companies have yet to fully embrace process automation. This is as true in the building materials industry as anywhere else. The unique challenges that building materials suppliers face can be overcome through scheduling, dispatching and analytics tools which simplify manual processes while increasing efficiency and lowering operations costs. Communication has expanded to be a vital part of a dealer’s operations. In the past, the only options available for communicating with drivers were via paper or phone. Since that time many companies have turned to on-board computers, smartphones, and tablets as a way to improve the ability of dispatchers to relay information to their drivers. Instant communication with one driver or with 30 drivers can now be handled simply and quickly through scheduling and dispatching software and messages sent directly to the drivers’ device. This provides the dealer and dispatchers with the ability to react swiftly to unexpected changes to a driver’s schedule. The key process of paperwork management also has gained significance over the years. As federal, state, and local regulations have increased, so has the amount of paperwork companies must oversee. Drivers are burdened with carrying and completing their DVIR, job site safety and inspection forms, and by collecting invoice signatures. These documents are now available electronically, stored on the driver’s tablet or smartphone so that they are available to the driver when needed without having to carry piles of paperwork. Completed forms can be accessed immediately by anyone back in the office. Safety and security have also become fine-tuned through advances in technology, in particular with the introduction of new routing, scheduling and mapping technologies. Drivers now have the benefit of commercial navigation which provides turn-by-turn directions, a valuable tool for safely and efficiently locating unfamiliar construction sites. GPS technology allows dispatchers to be aware of the progress of all their drivers at any given moment, which prevents numerous “where are you now?” phone calls and aids Customer Service through proactive communications with contractors. Lastly, the addition of scheduling software collects pertinent historical information and uses it to provide analysis on the cost of delivery, first trip capacity, and gross profit per journey. 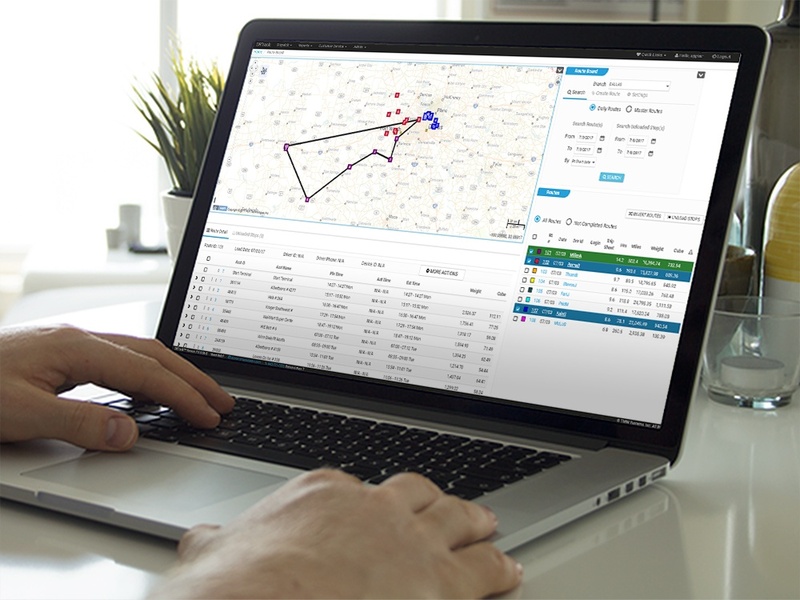 Detailed analytics help dispatchers make better decisions that can result in reducing overtime and miles, making the operation more efficient and, consequently, more profitable. From the 19th Century to today, successful companies have used the latest technology to make their businesses more efficient and profitable. Those that have been hesitant to adapt often found themselves struggling to stay competitive. When the difference between success and failure can be dictated by a volatile housing market, the economy, and governmental regulations, suppliers must consider the ways in which process automation can successfully help them navigate the ebb and flow emblematic of the building materials industry. 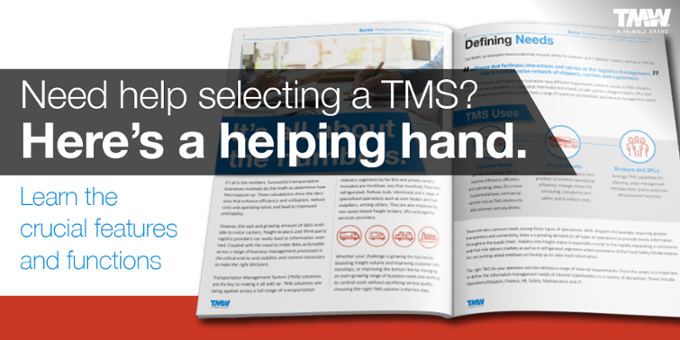 Learn more about TMW Systems Transportation Management Solutions for the Building Supply Industry at https://www.tmwsystems.com/software-services/routing-dispatch/last-mile-solutions-building-materials or download the white paper: Is your final mile suffering under increasing complexities and demands? Ready to gain the competitive edge? Contact us for details on how to optimize the transportation-related segment of your business processes.